If you’re self-conscious about your smile, you could be missing out on one of the simplest joys in life. No one wants to constantly worry about how their teeth look when taking a photo or talking to a friend. If your smile needs adjustment, our cosmetic dentist can help! Smiling can improve your relationships, happiness, and overall quality of life. Read on to learn about the advantages of smiling and how cosmetic dentistry can help. When you smile — that is, when you’re not afraid to open your mouth and show your teeth — you convey a sense of well-being and confidence. Smiling can be contagious. People respond positively to a healthy white smile, whether they’re a prospective dating partner or future boss. How healthy is smiling? Good question! Research shows that smiling improves health by relieving stress, lowering your blood pressure, and improving your mood. Smiling can also lift your face and help you look younger. All these benefits can have a profound effect on your overall quality of life. If you’ve ever felt self-conscious of your smile, ask about our options for cosmetic dentistry during your next appointment with us. To keep your smile for a long time, you’ll need to take care of yourself. We recommend scheduling a teeth cleaning and oral examination with our Kalamazoo dentist every 6 months. That way, we’re able to catch minor oral health issues before they grow into something more serious. For example, it’s much easier for us to treat a small cavity with a filling than to cover an entire tooth with a dental crown. The sooner our dentist is able to intervene, the better your outcome. The goal of cosmetic dentistry is to improve the appearance of front teeth that show when you smile and talk. Our dentist will be able to work with you to find the best cosmetic dentistry procedures for your unique circumstances. We recommend having a candid conversation with our cosmetic dentist about wanting to improve the appearance of your smile. A smile makeover can be one of the best decisions you ever make! A smile is one of the easiest ways to show confidence. However, if you are hiding your smile because your teeth are yellowed, missing, or deteriorating, you’ll miss out on all of the benefits. The goal of restorative dentistry is to improve the function of your teeth and gums. Depending on your oral health, this may mean filling in an empty space with a tooth implant or restoring the strength of a cracked tooth with a dental crown. Restoring the function of your teeth means you’ll have an easier time eating and talking. Stop into our office to find out about options for enhancing and restoring your smile. For instance, you might need dental implants, which can offer a permanent solution to dental problems. Our dentist is able to offer a wide range of cosmetic and restorative options. Don’t be afraid to ask about our dental services. Many of the techniques of the past have been replaced with modern, cutting-edge dental technology. For example, professional teeth whitening is not as harsh or cumbersome as it was when it was first introduced. There is a world of options for you and your teeth. By taking control and consulting our dentist, you will discover that improving your smile is not as difficult as you may have thought. You’ll be able to restore your smile and your confidence. And that, in turn, will give you back your quality of life. 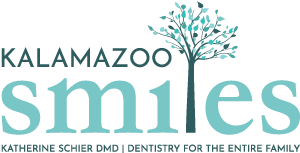 Our Kalamazoo, MI cosmetic dentist at Kalamazoo Smiles wants to help you smile with confidence, which is why we offer a wide variety of cosmetic dentistry services. To set up an appointment, give our office a call at (269) 353-3700!